Should I attempt to represent myself in my alimony case in California? Should I Represent Myself in My Spousal Support Case in Orange County or Los Angeles? FAQ: Should I Represent Myself in My Spousal Support Case? Generally, it is not advised that any person represent him or herself in a California family law case without proper legal education and the ability to remove yourself from the emotional ties to the situation at hand. However, some cases are easier than others when it comes to self-representation, and it is possible to consult an attorney for some things, and to handle certain things on your own. In a California spousal support case, the following are some factors that can make your case more difficult to handle on your own. • Other situations can also complicate your case. If you and your spouse can agree on spousal support, and you are sure about your decision whether you are agreeing to pay spousal support or receive it, you may be happy with the outcome of your case without the assistance of an attorney. Keep in mind that you can choose to consult an attorney for advice about whether or not you should hire an attorney - and you may consult more than one for varying opinions and rates. You may be surprised at their answers. 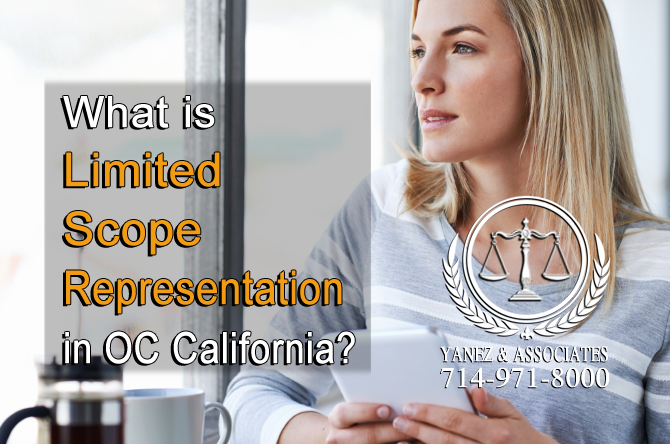 What is Limited Scope Representation in OC California? "Limited scope representation is a way to retain an attorney where you and your attorney agree that while you will hire and consult the attorney for assistance with some parts of your case, other parts will be left for you to handle on your own." You may also choose to consult an attorney, but not to be fully represented by one. 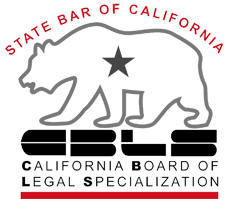 Limited scope representation is a way to hire an attorney in California where you and your attorney agree that while you will hire and consult the attorney for assistance with some parts of your case, other parts will be left for you to handle on your own. Your lawyer may assist you only by preparing and filing forms for you, while you represent yourself in court. Or, you may hire your attorney only as a coach to help you prepare for your court hearings. You may hire a lawyer just to assist you with pieces of the spousal support process that you find most difficult. When you meet with an attorney and hire him or her as limited scope representation in California, you can work out the specifics of your arrangement with the attorney. Why Choose Limited Scope Representation? Regardless of why you are considering foregoing an attorney in your case, limited scope representation may be a good option for you. • If you’re trying to save money, hiring a limited scope representation lawyer allows you to only use his or her services for some parts of your case, rather than the entire thing, and can save you money versus hiring an attorney for your entire case. The courts in California want every person to be able to hire a lawyer to assist with their case - which is why limited scope representation is allowed in California. Having an attorney on your side can also help you avoid mistakes that can extend your case and waste the court’s time. While not all attorneys offer limited scope representation, it may be a good idea to mention it to an attorney during your consultation. In Orange County, the attorneys at Yanez & Associates do offer limited scope representation for family law cases. Remember that while limited scope representation is a great alternative to facing your case completely on your own, in some cases you may need more. • Depending on your financial situation, the urgency of your case and your ability to maintain your lifestyle may be at risk. Weigh these potential consequences against your reasons for hiring or not hiring an attorney and the amount of representation you’re looking for. Ultimately, your best options is to discuss your case with a lawyer, and then decide whether or not to hire one, and how much representation you may want. 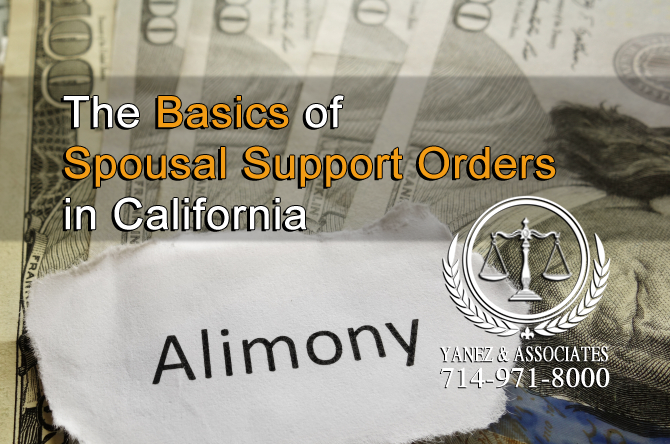 What are the Basics of Spousal Support Orders in California? California has two kinds of spousal support (or alimony) orders that you may request: temporary spousal support (which is valid during your case), and long term, or permanent spousal support. • Temporary Spousal Support - In California, temporary spousal support is valid during the legal process. Therefore, during your divorce, legal separation, annulment, or domestic violence case, you may either be awarded or need to pay spousal support until the final judgment can be made regarding your case. 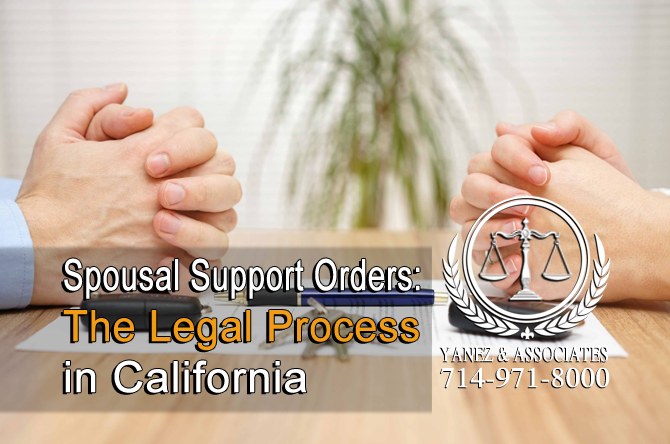 • Permanent Spousal Support - In California, permanent spousal support, on the other hand, is determined during your case, and will be awarded or denied at the end of the legal process. Spousal support does not usually last forever, but it will last as long as the judge deems it necessary. Permanent or long-term spousal support will usually end at some point, according to the terms of the spousal support order. Usually, it ends in one of the following situations. • If the person who is receiving spousal support remarries or enters into a new registered domestic partnership, they no longer need spousal support. What is the Legal Process in California for Spousal Support Orders? Like most things in family law cases, the best way for your case to be is usually when both parties have an agreement, they simply need a legal court order to put it in writing in a legally enforceable document. If you and your spouse or partner can agree on spousal support, you may write up and sign a written agreement, also called a stipulation, and submit it to the court for a judge to sign. In this process, it is not absolutely necessary for you to have an attorney, but it is highly recommended. An attorney may consider things that you didn’t know you should, or an attorney may have ideas on how to make your agreement better. Ask your lawyer what your legal rights are regarding spousal support before you sign anything. When you’re creating your stipulation, you’ll need to consider the following. • Which spouse will pay spousal support and which will receive it? • How much spousal support is reasonable and necessary? • How will payments be made? When will they be made? • How long will one spouse be supporting the other? Once you have considered the necessary factors, write up your agreement, and have your lawyer look over it. Once you and your spouse have signed the stipulation, you can submit it to the court. Make sure that you have at least two copies in addition to the original, and that you include all necessary forms. You may need a form to initiate a wage garnishment, or your local court may require specific forms be included with your stipulation. Once you have the judge’s signature, you’ll need to file it with the court, and each party should keep a copy for their records. If you aren’t sure whether or not you need to hire a lawyer for your spousal support case in California, it is best to speak to an attorney first. In your free, no obligation consultation with a family lawyer at Yanez & Associates, we can discuss your options with you as well as discussing our fees and getting to understand the basics of your case. Contact us today to schedule your consultation. 1 Should I Represent Myself in My Spousal Support Case in Orange County or Los Angeles? 2 What is Limited Scope Representation in OC California? 2.1 Why Choose Limited Scope Representation? 2.2 Is Limited Scope Representation Right for Me? 3.1 How Long Does Spousal Support Last? 3.2 When Does Spousal Support End? alimony, How Long Does Spousal Support Last?, Is Limited Scope Representation Right for Me?, Should I Represent Myself in My Spousal Support Case in Orange County or Los Angeles?, Spousal Support, Spousal Support Lawyers in Orange County California, Spousal Support Orders: The Legal Process in California, The Basics of Spousal Support Orders in California, What is Limited Scope Representation in OC California?, When Does Spousal Support End?, Why Choose Limited Scope Representation?, Will My Wife Get Alimony from Me for Life?